ow that the Sri Lanka Freedom Party (SLFP) has decided to grant nomination to ex-President Mahinda Rajapaksa to contest the forthcoming general elections, a sense of gloom has dawned on certain quarters of the public who genuinely loath the long-term effects of the ex-President’s political comeback. Such sentiments are quite understandable. A sizable portion of the total 6.2 million people who voted against the authoritarian ex-President now fear that he would roll back democratic reforms that were introduced by the new administration. Even if he fails to reverse democratic reforms which have already been implemented, chances are that, should he ever win and be appointed the Prime Minister, he would stall any new measures aimed at democratization. That would mean, among other things; the much awaited Right to Information Act risks becoming a non-starter; the UNP, for the second time, has killed the initiative through its procrastination. During the short-lived Ranil Wickremesinghe administration of 2003-2004, the Bill had been entered into the order paper when President Kumaratunga dissolved the then Parliament. And the bitterness of the anti-Rajapaksa camp has now been directed towards President Maithripala Sirisena, whom, they alleged, has ‘betrayed’ the January 8 revolution. Those feelings born out from the sense of frustration are understandable given the high expectations the public had placed in the President. However, the problem is while the sky is the limit for election promises, it is not humanely, or constitutionally possibly to achieve all that (unless, of course, the new President opts to emulate his authoritarian predecessor). There is frustration at the slow progress in the investigations into allegations of corruption levelled against the former first family and their cronies. That may be the case. However, the wheel of justice has been moving even though slowly and investigations have proved to be time-consuming. The alternative to that would have been the Rajapaksa model: Get your faithful female High Court Judge to jail your presidential contender on trumped-up charges (ex: Sarath Fonseka) or set up a Kangaroo Court under the euphemism of a court martial. President Sirisena did not choose that path; nor did Sri Lankans vote him to power to emulate the autocratic tactics of his predecessor. The partial paralysis in our institutions, which has for long been subjected to political manipulations, has partially helped Rajapaksa’s political comeback. However, by not interfering with the judicial process, the new administration has set a precedent on judicial independence and facilitated an organic growth of those independent institutions. One can only hope that MR, if he ever lands in the office of Prime Minister, would not reverse that process. "The bitterness of anti-Rajapaksa camp has now been directed towards President Maithripala Sirisena, whom, they alleged, has ‘betrayed’ the January 8 revolution. Those feelings born out from the sense of frustration are understandable given high expectations the public had placed in the President." Various segments of the public who are disheartened by MR’s political come-back, and cautious about the adverse effects the ex-President would bring upon our new democracy, blame President Sirisena for letting down the 6.2 million who voted for him. His offence is letting the ex-President contest under the SLFP. The emphasis on democracy in this particular discourse brings us to another interesting question: how ‘democratic’ it is to prevent (or lobby to prevent) someone -- who polled 5.8 million votes, just six months ago -- from seeking a popular mandate from voters to serve in a political office? Democracy is a two-way street. By announcing his desire to contest the elections, MR is exercising his democratic right. (Whether he would respect our democratic rights after he gets elected is a different question). Also, many millions of villagers are still loyal to him, partly due to the Rajapaksa regime’s extensive indoctrination of people in the personality cult of the ex-President. It is the democratic right of those masses to vote for the man they want.
" Various segments of the public who are disheartened by MR’s political come back, and cautious about adverse effects the ex-President would bring upon our new democracy, blame President Sirisena for letting down the 6.2 million who voted him." Of course, had MR opted to stay away from politics after his defeat in the presidential election, things would have been less complicated. However, once he threw his hat into the ring and announced his wish to contest the forthcoming general elections, the best his opponents, who loath his political comeback for a variety of reasons, could do is not to vote him. Instead, exerting pressure on the President against granting nomination to MR is counter-productive and sets a dangerous precedent that would take us towards a controlled democracy, something akin to that of Iran’s or the one that was proposed for Hong Kong and Vetoed by the executive council there last month. In both countries, election candidates are vetted by powerful State Bodies, (in Iran, by the Mullahs of the Guardian Council, and in Hong Kong by a Nomination Council dominated by the loyalists of Beijing) to weed out anti-establishment candidates. Such mechanizations turn democracy into a farce. In our system, it is the people who elect their leaders and the will of the people is sovereign (no matter our voters have shown a penchant to vote thugs, rapists and fraudsters to public office). By letting Mahinda Rajapaksa contest from the SLFP, President Sirisena has refused to play the role of the Mullahs in the Guardian Council. He is perfectly right. On the other hand, MR’s candidacy would provide expression for millions of people, who would otherwise have felt that they been left out by the system. They could well be a regressive lot; however, denying them their democratic voice could have a long-term destabilizing effort in our society. Provided that MR does not plan to zombify his receptive (and gullible) audience with racist rhetoric, his candidature could even strengthen the diversity of our democracy. Finally, some practical questions: Would it have been possible, after all, for the President not to accommodate MR in the SLFP ticket? Of course, he could have done that, but, not without endangering the SLFP to a major political split. President Sirisena did not want to be the man who destroyed the SLFP, though those like former President Chandrika Kumaratunga thought that taking Rajapaksa head-on was a risk worth taking. However, letting personal animosity take precedence over the survival of the political party SLFP is not a sound political judgment. "Also, many millions of villagers are still loyal to him, partly due to the Rajapaksa regime’s extensive indoctrination of people in the personality cult of the ex-President. It is the democratic right of those masses to vote for the man they want." Also those who wanted President Sirisena to stick to his guns disregard the fact that two general secretaries of the SLFP and UPFA, Anura Priya Darshana Yapa and Susil Premajayantha respectively, and the committee that was appointed to mediate between the ex-President and his successor were strongly in favour of granting nomination to MR. The President could have refused nomination to his predecessor, only by overruling the majority demand. That would mean, in the premise of defending democracy at large, the President would be undermining the inner-party democracy of the SLFP. There again, he refrained from emulating his predecessor who turned the SLFP into his familial enterprise. Of course, the President’s weak standing in the SLFP has made him further vulnerable to the pressure from the Rajapaksa coterie. However, the SLFP’s current sorry situation is a direct result of the decade-long political manipulation overseen by the Rajapaksas, who promoted a large group of sycophant parliamentarians whose political survival is dependent on their blind loyalty to the Rajapaksas. 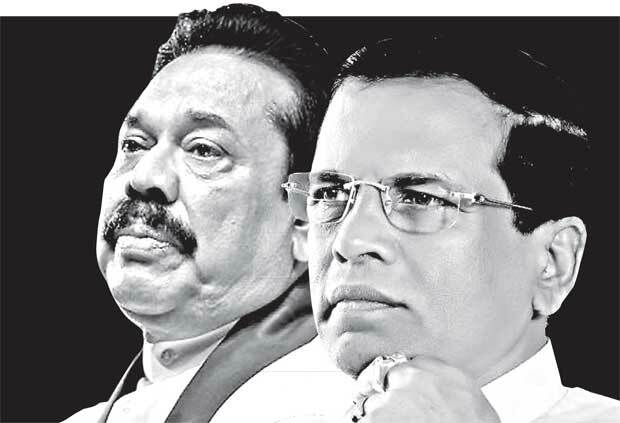 That President Sirisena could not break that grip is disappointing, however, given the long-term impact of Rajapaksa mechanization, President Sirisena has found himself in an unenviable position. And there is this tricky situation the SLFP/UPFA is faced with thanks to MR’s candidacy. Of course, his candidature galvanized some segments of the UPFA vote, but, at the same time, due to his political comeback, SLFP/UPFA has now lost minority voters, fair and square. The presence of Mahinda Rajapaksa and his acolyte Wimal Weerawansa would dissuade ethnic minorities (even those who would have opted to vote for SLFP, believing in President Sirisena’s pluralistic political message) from voting for the SLFP. The bottom-line is that with MR on board, the SLFP/UPFA has reduced itself to a party that would have to depend solely on the Sinhala votes. In other words, it has alienated 30 per cent of the total voters, even before the campaign begins. That is not a smart decision. However, the disturbing aspect in the over-reliance on the Sinhala Buddhist vote is that it would prompt the SLFP, MR and his coterie to incite racism in the South. Ethnic harmony would take a beating. "The bottom-line is that with MR on board, the SLFP/UPFA has reduced itself to a party that would have to depend solely on the Sinhala votes. In other words, it has alienated 30 per cent of total voters, even before the campaign begins." Perhaps the only winners in this status quo are the UNP, and its constituent parties to which the minorities would be forced to gravitate, if nothing else, at least due to the absence of a credible alternative. Also a sizable portion of Sinhalese who could have earlier voted for the SLFP/UPFA as a gesture of support to President Sirisena, would now have second thoughts. MR and Weerawansa have scared away the enlightened Sinhalese voters. Perhaps the impact of MR’s candidacy would be the exact opposite of what it was initially envisaged to be.